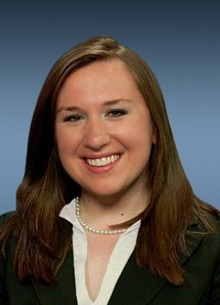 Kelsey Penna is an associate attorney at Bruckheim & Patel. Ms. Penna is a litigation attorney focused on protecting the constitutional rights of her clients. Her client-centered approach combines a vigorous drive to defend clients’ legal rights with a capacity to listen and understand their personal concerns with compassion. Ms. Penna represents clients in the Superior Court for the District of Columbia and at the District’s Department of Motor Vehicles. She focuses her practice area representing clients in Civil Protective Order (CPO) matters, expungement/sealing of cases, traffic and other criminal offenses, and family law matters for the firm. She works tirelessly to achieve excellence and ensure the best possible settlement or resolution for her clients. Ms. Penna additionally specializes in misdemeanor and felony criminal appellate work. Many of the appeals that she works on are currently pending at the District of Columbia Court of Appeals. Prior to joining Bruckheim & Patel, Ms. Penna worked on the other side of the bench as a judicial law clerk in Magistrate Chambers at D.C. Superior Court. As the Criminal Division law clerk, she supported the six Magistrate Judges assigned to the arraignment, preliminary hearing, domestic violence, and traffic calendars. Ms. Penna managed a high-volume of incoming motions and drafted hundreds of orders to seal, giving her an expertise in the expungement process. Throughout her clerkship, she developed relationships with each judge, which allowed her to gain a unique understanding of the law and litigation techniques from their perspective. In addition to Ms. Penna’s criminal background, she has experience in family law matters as well. While working as an attorney for the Women and the Law and Domestic Violence Clinics in law school, she successfully represented clients in obtaining CPOs, custody, and divorce agreements. During law school, Ms. Penna was a teaching fellow for the Marshall-Brennan Constitutional Literacy Project where she taught students at Anacostia High School about criminal and constitutional law and how it applies to their daily lives. She participated in the Pro Bono Honors Pledge and received the Highest Grade Certification for the Women and the Law Clinic. In her free time, she enjoys practicing hot yoga and exploring the many wineries and hiking trails in the DMV area. Ms. Penna earned her Juris Doctor from American University Washington College of Law. She graduated from the Pennsylvania State University with a Bachelor of Arts in Broadcast Journalism and English. Ms. Penna is barred in the District of Columbia.